Funnels may be used to separate solids from liquids, liquids from liquids and occasionally for pouring something into a container. BOROSIL� brand funnels are available in a comprehensive range for a variety of such applications. 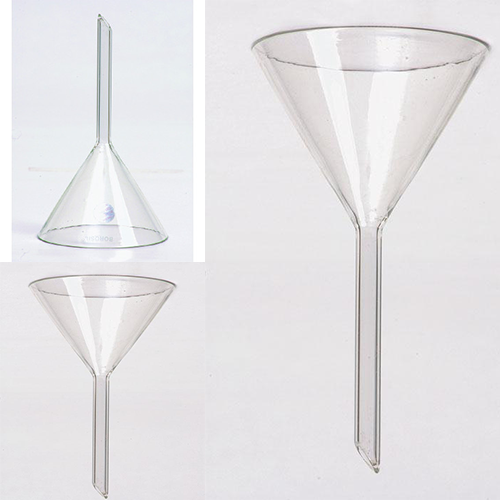 Sintered glass funnels are also available. Separating funnels come in globe and pear shapes with solid ground glass, PTFE and BOROFLO stopcocks and interchangeable solid glass stoppers. These funnels are made from specially moulded blanks. Stopcock bores, body openings and stems are carefully aligned to provide smooth, even liquid flow with fast cut-off. The sturdy design of BOROSIL brand funnels make them excellent for rack work.